Did you know that most cases of thyroid disease are autoimmune in nature? Hashimoto’s thyroiditis is an autoimmune condition that happens to affect the thyroid gland. This means that our immune system begins to recognize the thyroid gland as a foreign invader and begins to attack it, eventually leading to a destruction of thyroid tissue. When this destruction goes on long enough, the person will lose their ability to produce thyroid hormone. Hashimoto’s is a progressive autoimmune condition that results in the destruction of the thyroid gland and leads to hypothyroidism, and in some cases, to other types of autoimmune conditions. The condition may take many years to develop and is thought to be triggered by damage to the thyroid gland, which results in immune cells congregating in the thyroid gland, and eventually losing their ability to differentiate the thyroid gland from a foreign invader like a virus or bacteria. Hashimoto’s is not usually discovered until it has progressed to the advanced stages, where there is significant damage to the thyroid gland. It takes an average of 10 years to be diagnosed with Hashimoto’s between the start of the autoimmune attack on the thyroid gland and when the person is diagnosed. This is because conventional medicine doctors will only test the TSH, but that won’t be elevated until Stage 4. There are better tests—that are covered by insurance—that can reveal thyroid disease up to a decade before a change in TSH is detected. However, most doctors won’t run these tests until a change in TSH is seen. It is really quite backward! The longer this immune response is in place, the more thyroid damage occurs and the greater the likelihood of the person progressing to hypothyroidism, where the thyroid gland becomes so damaged, that it is no longer able to make enough thyroid hormone. If we could detect the condition earlier, we could prevent the damage (not to mention a decade of symptoms)! The most helpful tests for diagnosing Hashimoto’s include thyroid antibody tests (TPO and TG antibodies) and thyroid ultrasounds. If your doctor won’t order these tests for you, you can self-order them though Ulta Lab Tests, for a relatively low cost. Additionally, some insurances will reimburse patients for the labs they order through Ulta Lab Tests. Left unbalanced the immune system may go on to attack different parts of the body, leading to the development of other autoimmune conditions. There are no current treatment recommendations or guidelines in the world of conventional medicine to address the immune system attack on the thyroid gland. Rather, the focus is on restoring normal thyroid hormone levels. Giving thyroid medications to a thyroid deficient person is extremely important and can save lives, but this type of “rescue care” does nothing for preventing the progression of the autoimmune condition or for helping a person to heal from the condition. It’s akin to pouring more water into a bucket with a hole in it, without plugging up the leak! Medications are very important, of course, if someone has a low level of thyroid hormones, but they only address the symptoms and not the root causes of the autoimmune disorder. 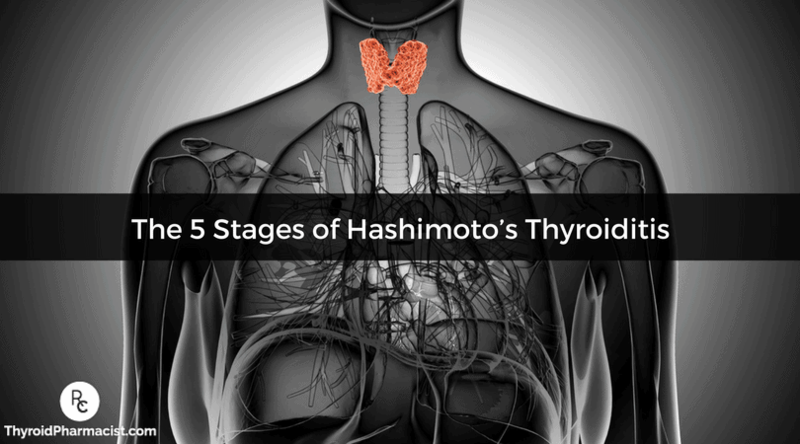 Wiersinga and colleagues in a 2014 article identified 5 stages of Hashimoto’s. In the initial stage, a person will have the genetic predisposition for Hashimoto’s, but they will not have been exposed to the necessary triggers thus, will have normal TSH, T4/T3 hormones, no thyroid antibodies and will not have any changes in their thyroid gland. Alternatively, this could be called Stage 0, as there are no manifestations of disease at this point. If you have thyroid disease, then this may be the stage your relatives and children are currently in. Or if you have a family member with thyroid disease and you’re reading this, you could be in this stage. This stage is the best time to think about prevention. Here’s a post I wrote on preventing Hashimoto’s. Hashimoto’s is characterized by an overabundance of lymphocytes (white blood cells) in the thyroid gland. In small amounts, these immune cells play an important cleanup role, but when there are too many of them in an organ, this means trouble. It is thought that initially, the immune cells may be there with good intentions, to clean up dead and diseased thyroid cells, but at some point, they begin to attack healthy thyroid tissues as well. In this early stage of Hashimoto’s, a person will usually have elevated thyroid antibodies. Up to 80-90% may show an elevation of thyroid antibodies when tested in blood, thyroglobulin antibodies, and thyroid peroxidase antibodies, respectively. However, some people may never have thyroid antibodies present in blood, but sure enough, upon a thyroid ultrasound or biopsy, changes in the gland consistent with Hashimoto’s will be apparent. This stage may go on for decades before enough damage is done to detect a change in thyroid hormone levels on a blood test—at this stage, the TSH, Free T3, and Free T4 levels will be normal. Even in this stage, people may be symptomatic and may have symptoms like anxiety, fatigue, miscarriage/infertility, mood swings, excess weight or weight loss, because their body is fighting hard to keep their thyroid levels normal, and this can be exhausting and draining on the usual body functions and nutrients. Additionally, in this stage, there is always impaired gut wall function. This is the ideal stage to instill lifestyle interventions and the root cause approach to prevent the progression of the condition and damage to the thyroid gland as the inflammation in your body has just begun. In a broad overview, you need to identify your triggers and strengthen your body by addressing food sensitivities, nutrients, intestinal permeability, toxins, stress, and chronic infections. I’ve had many people reverse their antibodies and symptoms at this stage by just going gluten-free, but some may need a deeper exploration. I outline my tried and tested protocols for doing all of the above in my book Hashimoto’s Protocol. Yes, this is known as seronegative autoimmune thyroiditis, or serum negative Hashimoto’s. 80-90% of people with Hashimoto’s will have TPO antibodies, TG antibodies or both. However, some people will never test positive for thyroid antibodies, yet may have full blown Hashimoto’s, with all the symptoms associated with it. In serum negative Hashimoto’s, the person will still have the hypoechoic pattern on their thyroid gland upon ultrasound examination that is seen with Hashimoto’s and thyroid antibodies but will not have measurable circulating thyroid antibodies. Rotondi and colleagues have determined that seronegative autoimmune thyroiditis is a less aggressive form of Hashimoto’s, but nonetheless, the person may still develop hypothyroidism and even progression to other autoimmune conditions, which may or may not have respective positive antibody blood markers (such as seronegative rheumatoid arthritis). People who do not have thyroid antibodies will likely have smaller thyroid glands and are less likely to have goiter compared to people with Hashimoto’s antibodies. Serum negative Hashimoto’s should be treated the same way as serum positive Hashimoto’s, of course with the exception of tracking thyroid antibodies. In serum positive Hashimoto’s, thyroid antibodies can be used as a marker to determine if one has reduced the autoimmune process. The next stage of Hashimoto’s is known as subclinical hypothyroidism. In this stage, the TSH may be slightly elevated on blood tests (3-10), and the levels of free T3 and free T4 are going to be normal. The person’s thyroid antibodies may be even higher than in Stage 2, as increases in TSH can increase the inflammation of the thyroid gland. Some individuals, however, will continue to be antibody negative. In the world of conventional medicine, this stage is controversial in terms of treating. They may take a “wait and watch approach,” but if nothing is done, this is the stage where one would begin to experience more symptoms and will eventually progress to overt hypothyroidism. Some individuals have been able to reverse their condition at this stage without using medications, but I would not linger in this stage for too long, as an elevated TSH contributes to thyroid gland inflammation. Studies have shown that adding a small dose of thyroid medication at this stage to lower the TSH results in a reduction of thyroid antibodies and can also make a big difference in your symptoms. While I understand that some people may have a dogma against medications and would prefer to do things the natural way, as a pharmacist, Hashimoto’s patient, and advocate, I am not a proponent of telling my readers to martyr themselves for a cause. In contrast to other medications that act as artificial chemical messengers to block or activate pathways in our bodies, thyroid medications are the same chemical structure as our internally produced thyroid hormones, and most of the symptoms associated with thyroid medications are usually due to improper dosing. Thus, I, along with most progressive, integrative, and functional medicine physicians, will often recommend thyroid hormone treatment at this stage (some even advocate treatment with thyroid medications during Stage 2)! To learn more about optimizing thyroid medications, download my FREE eBook! In some cases, once the autoimmune attack is balanced, the person may be able to wean off thyroid medications naturally under their doctor’s supervision. Lifestyle interventions and the root cause approach are also critical at this stage to feel better, to prevent further damage, and to reverse the condition! At this stage, the person has started to have thyroid gland failure. Their thyroid gland will be destroyed to the point where they will no longer be able to make their own thyroid hormone. The person will have an elevated TSH, with low levels of Free T3 and Free T4. Thyroid antibodies may be even higher than in previous stages. This is the most common stage when a person is diagnosed, as the person usually has a significant amount of thyroid symptoms at this point. This is the stage where a person will require thyroid medications to prevent serious health consequences. Even the staunchest conventional physicians almost always recommend thyroid medication at this point. Lifestyle changes and the root cause approach are critical at this stage, as you will likely be very symptomatic. Since you will have likely had an inflammatory process in your body for almost a decade at this point, you will need to take on the most aggressive treatment. I often recommend LDN at this point to prevent progression of autoimmunity. At this point, natural tissue regeneration is going to be much more challenging, but luckily, there are new options that exist that can accelerate tissue repair (see LLLT article for experimental strategies that can accelerate thyroid tissue repair). This is a progression of the autoimmune response—as the immune system continues to be imbalanced, it may find additional glands and body tissues to attack, such as the small intestine in celiac disease, saliva and tear glands in Sjogren’s, and the joints in rheumatoid arthritis. At this stage, the person will have been likely treated with thyroid medications, so if they are receiving ideal treatment, their TSH, Free T3, and Free T4 numbers should be in good range. But, unfortunately, thyroid medications and removing the thyroid gland do nothing to stop the disease progression. If a person is not well controlled with medications, has an enlarged thyroid gland, out of control antibodies, Graves disease, thyroid nodules, thyroid cancer or are not able to have balanced thyroid hormones as they swing from hyper/hypothyroidism, some doctors may recommend surgical removal of the thyroid gland. Removing the thyroid gland will eliminate thyroid antibodies, but unfortunately, will not stop the autoimmune progression. Additionally, people who have had their thyroid glands removed (or who have gone through radioactive iodine treatment) may suffer adverse reactions from these procedures and will need to take thyroid medications for the rest of their lives. It is still possible to reverse autoimmunity and significantly reduce and eliminate the symptoms of other autoimmune conditions. I recommend the fundamental Hashimoto’s Protocol approach, as well as many of the advanced protocols at this stage, including LDN, the Rotation diet and treating infections to help you reverse the autoimmunity. As long as the thyroid gland has not been completely destroyed, surgically removed, or treated with iodine, there is still some hope for restoring function through advanced protocols like low level laser therapy. Depending on how advanced the other autoimmune conditions may have become, the person may need additional organ-specific therapies that are beyond the scope of this article (such as specialized exercises, medications, and whole body light therapy for multiple sclerosis). **Please note: autoimmune conditions do not always start with Hashimoto’s. It is thought the first organ that becomes susceptible to autoimmune damage is the “weakest link” where the person has a genetic predisposition or the organ has become damaged. Hashimoto’s is the most common autoimmune condition, but the thyroid gland is not always the “weakest link” for everyone. A person may start off with a different autoimmune condition, like celiac disease, and then progress to Hashimoto’s. When I was diagnosed with Hashimoto’s, a part of me was relieved. I felt like I had the answer to my many years of symptoms and that perhaps thyroid medications would help me feel normal again. But another part of me was confused; if my immune system was out of balance and causing my thyroid problem, why am I not trying to balance my immune system? It seemed foolish. Of course, ignoring my brother never worked, and eventually, I had to take things into my own hands. Now, while ignoring him didn’t work, fighting certainly didn’t work either (he’s 4 years older and got the tall genes). It took some creative, outside of the box thinking, and eventually, I found a way to outsmart him and he stopped picking on me. I was always a little nerdy, so I offered to do his homework and write his papers for him in exchange for some peace and respect. Same for thyroid disease; rather than ignoring the condition or becoming a “thyroid warrior” where we are essentially battling ourselves, we need to think about how to outsmart the condition! I felt like a little kid in the doctor’s office again, and I wanted to know if there was anything I could do to outsmart my immune system. Additionally, while my energy and anxiety levels and weight all improved once I started on thyroid medications, I also had many other symptoms that were not “thyroid related” per se and not responsive to thyroid treatment, like my acid reflux, irritable bowel syndrome, joint pains and I was still more tired than I wanted to be. I knew that I could not change my genes, but perhaps if I were to find and identify my triggers I would be able to prevent the progression of the condition. So I searched for ways to reverse autoimmunity and came across a word that became my goal… Remission. Remission is defined as “the state of absence of disease activity in patients with a chronic illness, with the possibility of the return of disease activity.” While a remission was not the same as a “cure,” I thought it would be a more realistic goal to shoot for. The remission stage is the point where a person has addressed their underlying triggers and has eliminated them. The person will have a healthy gut and adrenals, be cleared of toxins, have appropriate levels of macro and micronutrients, and they will likely have seen a significant drop in their thyroid antibodies. The goal is to get them <35; some people have been able to reduce theirs down to 0. The Hashimoto’s Protocol is focused on achieving gut, adrenal, detox and establishing healthy levels of nutrients. While there is no cure for Hashimoto’s, we can put it into remission by eliminating the underlying triggers and thyroid antibodies, and we can regenerate and heal thyroid tissues (in many cases) using innovative, experimental therapies. Though some endocrinologists may say that it’s inappropriate to diagnose a person without any thyroid symptoms and “normal TSH” with Hashimoto’s solely based on the presence of thyroid antibodies (which may be present in 10-20% of the population), a 2013 study found that people with thyroid antibodies have similar structural features and blood flow patterns on ultrasound as those with Hashimoto’s who have progressed to overt hypothyroidism. Thus, changes in the thyroid gland may start long before the symptoms of hormonal imbalances finally manifest. In my opinion, I believe that people should be screened for Hashimoto’s through antibody testing and/or ultrasound studies. This early detection of the autoimmune process will help a person prevent a myriad of unpleasant symptoms, as well as even prevent the need for medication if the root cause of the condition can be identified. While it’s possible to regenerate thyroid tissue and return to normal thyroid function (even with normalization of thyroid tissue appearance on ultrasound), it’s obviously much easier to prevent damage than it is to repair it. My book Hashimoto’s Protocol can help you address your Hashimoto’s, regardless of the stage, and even if you’ve had your thyroid gland removed! I hope that this information helps you on your journey! Very good information. For years my doctor could not find anything that even made him suspect I had a thyroid problem. When our daughter was diagnosed with Hashimotos , her endocrinologist wanted to check me. The doctor herself did the ultrasound and immediately found one side of my thyroid smaller than the other. I started with a small dosage of thyroid medicine which has been increased since then, but now I feel much better. I have regular appointments with my endocrinologist now so she can watch my progress. Nothing ever showed up in just regular blood work. Thanks for this info. My 16 year old daughter was recently diagnosed with Hashimotos disease. I live in NJ outside the Philadelphia Area. Is there a doctor or doctors that you can refer. The endocrinologist we saw today did exactly what you wrote. How can I find a doctor who would be willing to prescribe LDN and even work on her diet. She is gluten free already because of all the digestive issues you mentioned are related to this disease. She has had problems since she was 6 years old with gluten. Rosa – thank you for following this page. I highly recommend that you work with a functional medicine clinician. It’s an entire medical specialty dedicated to finding and treating underlying causes and prevention of serious chronic disease rather than disease symptoms. I also had this problem, where a doctor wrote me off and told me anything I might want regarding “remission” was basically a pipe dream. Needless to say that was disheartening. However, it fed the fire to prove it wasn’t just a dream. I am going to start with a doctor here in Ohio that is titled a “functional medicine” doctor. He goes in depth and looks for the root causes, and things that could be affecting my body that I don’t know about. I am hoping this approach, and this functional medicine will do things my “drug” doctor wouldn’t even consider. The only down side I see right now to trying this new approach is it probably will not be covered my insurance because it isn’t “necessary”. But, at this point my dream, inspired by Dr. Izabella, is priceless. Christina – thank you for sharing your journey. <3 I am so happy you have found a Functional M.D. and I am looking forward to seeing your progress on this here. Here are a couple articles you might find interesting as well. Hi this is kinda a random comment. But I was diagnosed when I was 7 with Hasimotos and I’m now 16. I take medication to act as my thyroid hormone. I think I was able to be diagnosed so early because my mom also has Hasimotos. I never realized until now that I was kinda young to be diagnosed. I go 2-3 times a year to the endocrinologist and get labs taken to motor my levels. It just became normal. So I was curious as to what Hasimotos actually is now that I’m older, and your article really helped. Thanks! I’m so grateful to have fond your website. I was diagnosed with Hashimoto’s disease 8 years ago after having my first child. And the Dr put me on levothyroxin 50, which is low dose and things were ok but not so good. She didn’t say anything about changing my diet witch made things go downhill with my second pregnancy. My thyroid gotg bigger and my symptoms got a lot worse, then they discovered that I have white spots on my brain and they said it’s MS but I had no symptoms other than severe headaches. I decided to see a natural path, and that changed my life. The natural Dr told me it’s not MS and helped me change my diet and with time my thyroid got as better as it can be, and my levothyroxin was lowered to where I had to take half a of 25mg pill then I stopped taking medication. I was so happy with low energy but no medicine for 2 years. But now my thyroid went back to the way it started and it’s getting bigger and my levothyroxin is back to 50:( even though I’m still going gluten and dairy free, I’m trying to avoid soy but it’s hard because its in almost everything. I don’t know what else to do! Please help if you can think of anything! P.S. what did you mean when you said treat infections? Like any infection, or only sever one’s trigger antibodies? Nagham – thank you for reaching out. Nodules and goiters are often the result of toxicity and/or the autoimmune process. So, doing interventions to reduce the autoimmune attack on the thyroid, and toxicity, can be helpful to reduce them. Most thyroid conditions result from the immune system attacking the thyroid because the immune system is out of balance. Even when the thyroid is taken out surgically or treated with radioactive iodine the autoimmunity still persists in most cases. Many people will have their thyroids removed, and will develop new autoimmune disorders such as Lupus, Rheumatoid arthritis, etc. The immune system just finds a different target. Im on 300mg thyroxine a day & i seem to be getting more & more tired & i have no energy, i also have a b12 deficiency which i have monthly shots for. I am also having trouble staying asleep awake roughly 4-5 times a night. Can you give me any advice on this or is it best to see my own doctor. Please, understand that due to liability issues, I am unable to answer specific medical questions. I highly recommend that you work with a functional medicine clinician. It’s a whole medical specialty dedicated to finding and treating underlying causes and prevention of serious chronic disease rather than disease symptoms. Hi I ordered your book. I was recently diagnosed and went on medication. My hair was falling in clumps and stopped for some time but it’s falling again. My blood work looks fine except for the antibodies that’s high. I am still on medication what do you think I can do to help this. Valerie – thank you for following this page. Hair loss is a distressing symptom experienced by women with Hashimoto’s. For women, our hair represents our femininity, and losing our hair is a constant reminder that something is off and that we are not well. Have you read these articles? Do you have a list of functional/holistic doctors in the Chicagoland area? I have your book but feel I need a doctor to work with me. Thanks for all your good work and Congratulations on the #1 Bestseller!!! I highly recommend that you work with a functional medicine clinician. It’s an entire medical specialty dedicated to finding and treating underlying causes and prevention of serious chronic disease rather than disease symptoms. So Far in the researh and disovery stage……significant issues of Thyroid, Diabetes, and other immune issues very prevalant I have more autoimunite issues that nedd to be addressed. When I was first diagnosed with Hashimoto’s, I felt so alone. My doctor didn’t think it was a big deal, and none of my friends or co-workers had it. It wasn’t until I started to research online that I found others who were going through the same thing. A couple of years after my diagnosis, I found Hashimoto’s 411, a closed Facebook group run by Alice Berry McDonnell. This group is amazing! It is comprised of an army of highly motivated, smart, supportive women and men (now 45,000+ strong), and each of them sharing ideas of what worked for them, things they were planning to try, and offering support to one another. The comfort I received from knowing that there were others going through the same challenges as I, was enormous. Ask questions. Post your thoughts. Scan the files. It is an absolutely amazing resource. Best of all it’s kept private from spammers. How would one gi about Adrenal Detox please ? ?, I have Cronic IBS and have addressed this problem, and have eliminated gluten, and nuts as they were a huge problem. I have also suffered with quiet severe spondylitis for the last 15 years. Any suggestion. Michelle – thank you for following this page. Please, understand that due to liability issues, I am unable to answer specific medical questions. Can you please give me advice on how I can improve my 13year old daughter’ energy? She has Hashimito’s and is currently taking Euthyrox after a month of Eltroxin. Her symotoms just seem to be getting worse and we are only seeing her endo in a months time. ANY advice would be greatly appreciated! Thank you. I have both your books and am in the process of healing my thyroid after being on Thyroxin for 20 years. I’ve been dairy, gluten and soy free for 5 weeks and have more energy than I had 10 years ago. I’ve also lost 4.5kg. I went to my GP to get all the tests you recommend. He wouldn’t do Tg Antibodies…because my thyroid is underactive. When I told him that I had cut out gluten he was concerned. .he said you need gluten in the diet! So I asked if I can have a gluten sensitivity test. He said I have to eat gluten for 2 weeks and then get tested for coeliac serology. Will eating gluten for 2 weeks affect my antibodies? Will they be elevated if gluten is a reason for my Hashimoto’s? Nicole – thank you for following this page. Please, understand that due to liability issues, I am unable to answer specific medical questions. It depends on the person and their individualized food sensitivities. Some people go into remission just gluten free, others may have to go as far as autoimmune Paleo. The most common triggers in Hashimoto’s are nutrient deficiencies, food sensitivities, intestinal permeability (leaky gut), stress, an impaired ability to get rid of toxins and in some cases, infections. Optimizing your health starts with food. Figuring out which foods nourish you, and which ones cause you harm is the single most important thing you can learn in your health journey. I’ve found that recognizing and eliminating reactive foods can be a life-changer for most people with Hashimoto’s. Most people will see a dramatic reduction in gut symptoms, brain symptoms, skin breakouts, and pain by eliminating the foods they are sensitive to. Some will also see a significant reduction in thyroid antibodies! An additional subset of people will actually be able to get their Hashimoto’s into complete remission just by getting off the foods they react to, normalizing their thyroid antibodies, and some even normalizing their thyroid function! I’ve been following you forever! You are the only one who really understands the thyroid. I have your other book and I will be purchasing your new book. This article helped me because I am feeling overmedicated and starting going lower on my meds. Just had my bloods drawn waiting on results. I have Hashimoto’s, celiac, sjogrens. I’m taking NDT and LDN and my vitamins. So it is possible to reverse this? How do I get guidance? My doctor asks me what amount of NDT I want next? He’s a decent doctor because he prescribes LDN which is hard to get. I’m going on how dizzy I feel versus am I getting sleepy? Not very scientific. Thyroid tissue can regenerate, but the rate at which it does is not always predictable. Thus, some are able to stop the autoimmune attack on their thyroid and regain normal thyroid function. Others can reduce the dose of medications, and others will need to stay on the medications indefinitely. I'm currently working on some protocols to help with tissue regeneration. Is it possible to get a consultation for my condition. Though I have symptoms ever since year 2000, I have never been treated properly except being prescribed Thyroxine. Thanks in advance. Bea – thank you very much for your inquiry. I do provide a limited number of consultations, however, my consultative schedule is all full at the moment. I have a 12-week online program called Hacking Hashimoto’s that covers all of the strategies that I go through with my one-on-one clients, in a self-paced format, so that participants have access to all of the things I’ve learned about Hashimoto’s without having to schedule costly consults with me or another practitioner. There are a few requirements that you should pay attention to, such as my book is a required read. In addition, any person that goes through the program will have the opportunity for a follow-up consultation with one of my thyroid pharmacist consulting members. Lastly, here’s the link to the book in case you have not read it already. Im 49 years old and in 2013 I became sick lost 40 pds in 3 weeks and was anxious , tired, depressed just horrible! Couldn’t go to work. I wnt from Hypo to Hyper and it took 6 months for me to feel better. Was on Antidepressant and anti Anxiety meds. Until the high dose which I was on 150 synthroid left my body and then i was on 112 synthroid. Again in 2016 same thing happened i was on 175 synthroid. horrible feeling! Was feeling better by August another 6 months. Now its April 2017 Feb I started feeling strange again. All Im told is Antibodies will always be high and can’t be reversed I’m so upset and tired of feeling this way and Drs. just thinking its physiological? Of course it is ? Im not making this up!!! Please help. Thank you in advance :0) Just want to feel myself again. Donna- Thyroid tissue can regenerate, but the rate at which it does is not always predictable. Thus, some are able to stop the autoimmune attack on their thyroid and regain normal thyroid function. Others can reduce the dose of medications, and others will need to stay on the medications indefinitely. I’m currently working on some protocols to help with tissue regeneration. How likely is it that someone with Hashimoto’s will develop other auto immune diseases? My daughter, age 20, was recently diagnosed and we are working on getting her dosing right. Once that’s done, is it definitely/probably/possibly/not likely that she’ll come down with something else if she does nothing else to treat the disease (i.e. gluten-free eating)? Glenda- Hashimoto’s may be associated with other autoimmune diseases like Type 1 diabetes mellitus, multiple sclerosis, rheumatoid arthritis, celiac disease, lupus, Addison’s disease, pernicious anemia and hypoparathyroidism. Polyglandular autoimmunity is a medical term used to describe when one person has two or more autoimmune diseases. Here is some information you may find interesting. Developing autoimmunity is like a three-legged stool, all of these factors must be present for autoimmunity to occur! When you remove one of these, you can prevent or stop autoimmune disease. While we can’t change genes, if we know the trigger, we can remove it and we can heal the gut. So if she doesn’t do anything to change one of these “legs of the stool”, is she mostly to develop other diseases? She currently has no other symptoms except for the fatigue and menstrual irregularities which seem to be getting better with the medicine. I’ve been ill for over ten years around 5 yrs ago I had to travel west to Nevada for a funeral I currently live in IL. I was only there 3 days but by the 2nd day I was feeling amazing. Went home feeling horrible again well last yr I decided to go for an extended stay I was there for 3 weeks while there again by third day my thyroid shrunk I wasn’t short of breath my heart stopped racing no more joint pains and everyday there felt more and more amazing. It seems that my problem may be environmental I see a lot about gut health and thyroid disease but not what in the environment that can cause it. And is my only choice to move. Donna- Here is some information you may find interesting. Did you move Donna? Did you feel better and did you figure it out if it was the weather, or the water or something else? Hi Izabella, I have ordered your new book and can’t wait for it to arrive. I know you can’t give specific medical advice but I was wondering if you had any general weight loss tips for people with Hashimotos. I am gluten and soy free and working up to going dairy free but I just can’t seem to lose the extra weight. I am also working with a Functional Medicine guy and have a good doctor but no-one seems to be able to help with the weight loss. Thanks! Charlotte- Thank you so much for your support. I’m looking forward to hearing your progress on this page. Make sure to take the book slow, take notes, highlight, and establish a baseline when making changes. When it comes to weight gain these are a couple of things to think about. 1) What was your recent TSH, Free T3 and Free T4? Sometimes when those numbers are on the outskirts of normal, your metabolic rate may still be impaired making it more difficult for you to burn calories. Most people report feeling well with a TSH between 0.5-2. 2) What type of medication are you on? Some report more weight loss with T4/T3 combinations (Armour, Nature-Throid, compounded medications) versus T4 medications (Synthroid, Levoxyl, Tirosint) alone. T4 is a precursor to T3, but some individuals do not convert T4 to T3 properly, and the T3 component is the metabolically active one. 3) What type of diet are you eating? Some report more weight loss with T4/T3 combination vs T4 alone. Some do not convert T4 properly.The Standard American Diet (S.A.D.) full of sugar and simple carbohydrates is perfectly designed to cause us to gain weight year after year. Even yogurts that are marketed as “healthy” contain the equivalent of 16 teaspoons of sugar. Divorcing the S.A.D. is often a step that many of us must take to not just lose weight, but to also feel better. Some diets that have been helpful include the Body Ecology Diet, the Paleo Diet, the Virgin Diet, Autoimmune Paleo Diet, GAPS diet, SCD diet, Weston A. Price Diet, or the Mediterranean Diet. You may need to modify these diets to your own individuality. Hi There, I was just wondering is hypothyroidism called Hasmito’s? I have had hypothyroidism for 23 years. I have no thyroid funtion which has led me to some difficult changes. I have depression and anxiety, and have recently discovered pain in my foot which radiates up to my hip. Can this be a sign of MS? Laura – thank you so much for following this page. Did you know that if you live in the United States, Australia, Europe and most developed countries that add iodine to the salt supply and take thyroid medications, there’s a higher probability that you do have Hashimoto’s? I have been in a weight loss program for a little over a month and even though I’m working really hard changing up my diet and exercising I feel like I’ve been gaining more weight because of stress and I’ve been struggling so bad. I am trying to educate myself more about my condition and I feel like I don’t even have a doctor just going to give me the right medication I’ve been taking the same medication for 6 months and I feel like it’s not even helping. But because of my insurance I feel like I always get really crappy doctors that just don’t care about me all I want is just money. I am almost to a point where I want to give up I don’t know where to go or who to talk to and I really could use some advice. Hello! Since 15 I have found Hashimoto. Until now I have had no problems, but I suffer from depression for about 5 years and doctors suggest it is from Hashimoto. Now my treating physician prescribed L-tiroxsin and the endocrinologist Eutyrox. Do you think there is any possibility of an alternative treatment method for Hashimoto. These is my indicators that’s are not in the norm others are okay. Elenka – thank you for following this page. A couple of years after my diagnosis, I found Hashimoto’s 411, a closed Facebook group run by Alice Berry McDonnell. This group is amazing! It is comprised of an army of highly motivated, smart, supportive women and men (now 50,000+ strong), and each of them sharing ideas of what worked for them, things they were planning to try, and offering support to one another. I watched your nine week series in completion. I read the Root Cause. I also got your book the day it came out Hashimoto Protocol. I am under the care of a naturopath who follows you as well. I have had all the blood, stool, urine tests etc. I have followed the AIP paleo for six weeks now religiously. I do everything your book says to do. I am on nature throid. I work out regularly, cardio regularly too. I have eaten well for many many years. I have been on synthroid for many years prior to a year ago. I am on progesterone and estrogen. I am on all the supplements you recommended. I am 58 and very healthy and in shape except for a minor struggle with weight. Until a year ago. I gained 20 pounds in six months. This is horrendous to me. So my question for you is..In the last six weeks of very strict gluten free, dairy, soy, sugar, egg free diet ( I even gave up nuts and caffeine for two weeks..no change so I brought them back in) I have lost three pounds. My only symptom of Hashmmotos are my labs, the extreme weight gain and inability to lose weight. I always feel great and have energy. I just am gaining weight and can’t lose it!! I have h. pylori. Currently I am on your triple antibiotic regimen. When this ends in three days, I will start LDN. I am hoping this will then allow me to start repairing the leaky gut. Agh! Can you give me any helpful advice? Can you give me any other thoughts as to what to do? Thank you so much for all you do for us. I have already given your info and books out to many people. When it comes to weight gain these are a couple of things to think about. 3) What type of diet are you eating? Some report more weight loss with T4/T3 combination vs T4 alone. Some do not convert T4 properly.The Standard American Diet (S.A.D.) full of sugar and simple carbohydrates is perfectly designed to cause us to gain weight year after year. Even yogurts that are marketed as "healthy" contain the equivalent of 16 teaspoons of sugar. Divorcing the S.A.D. is often a step that many of us must take to not just lose weight, but to also feel better. Some diets that have been helpful include the Body Ecology Diet, the Paleo Diet, the Virgin Diet, Autoimmune Paleo Diet, GAPS diet, SCD diet, Weston A. Price Diet, or the Mediterranean Diet. You may need to modify these diets to your own individuality. Very informational page, thank you. However, I disagree with a few of your statements or at least I don’t think they are universally valid. I have quite a severe form of Hashimoto’s. I haven’t had devastating symptoms until 2 years ago, when Iiterally crashed. Before that, I experienced episodes of fatigue when doing sports (mainly endurance), had dry skin, hives (uticaria), episodes of sweating, racing heartbeats and nightsweats. But it alway subsided after a couple of weeks and I did no longer think about it. Until 2 years ago. From that point on, it took me another year to get diagnosed. At this point, I was already unable to work, severly exercise intolerant and mostly housebound. However, I NEVER had elevated thyroid antibodies. And my case is really severe. That’s why I think the statement of no antibodies means a milder course of the disease is simply not true. I know other patients who have also become bedridden and developed other autoimmune conditions without ever having elevated antibodies. The same goes for the TSH: I was already incapable of working and forced to stay home, but my TSH wan’t clinically elevated – it always stayed around 2.8 to 3.2 with a normal range up to 4. It wasn’t until much later when I was already being treated with levothyroxine that labwork showed a TSH of 5. Also my ft4 and ft3 habe never shown below the normal range. They were low for sure, but never abnormal. In case you’re wondering, I’ve been diagnosed due to my obviously hypo symptoms and a thyroid-ultrasound. It showed a total thyroid size of only 5.5 ml (for males over here in europe the normal range is between 18 – 25 ml) and excessive perfusion of my thyroid (all red and yellow on the ultrasound), which is a clear sign of inflammation. However, the remaining structure of my seems echonormal. So here again, there isn’t anything that cannot be found when it comes to Hashimoto’s. I hope this helps other sufferers and maybe even doctors to think again when diagnosing this disease. Stefan – thank you for following this page and for your feedback. Absolutely, some people with Hashimoto’s test negative for thyroid antibodies because their overall immune health is so weak they do not produce enough antibodies. I’ve tested negative for antibodies several times. Now I’ve insisted on a thyroid ultrasound. Given that Hashimoto’s is one of the leading causes of hypothyroidism worldwide, I wouldn’t stop until I know one way or another. I was recently diagnosed with Hashimoto’s and I believe I fall somewhere between stage 2 and 3. I have the antibodies but my TSH, FT4 and FT3 are in the normal range (although my FT3 are at the low end of the normal range.) My doctor said that we need to wait until those level are out of range to be treated and we should test my blood again in a year, however I am symptomatic. So after reading some of your articles and your latest book, I decided to try some supplements. I was wondering if in your opinion the pure encapsulations women’s nutrient would be helpful as I don’t currently take any other multivitamin and it seems to cover the zinc and selenium your advise or should I skip the multivitamin and just try the separate zinc and selenium. Meridith – thank you for following this page. I have just a question if you can help . Doctors are pushing me for surgery and i don’t want to go with it . Hi I just found out I have Hashimoto and I am wondering when I read your stages where I am at. They seem to base it off of the TPO being high in addition to the TSH elevated. The T4 free was normal range (barely) and T3 they didn’t test for (although I changed docs and am now awaiting results for T3 free). What are the ranges for TPO? and does that help determine the stage your in? They ruled Diabetes out and not sure they tested for others. Does Hashimoto make it so you can’t exercise or may cause you to injure yourself easier until you get your levels in a good range? Annemarie – thank you for following this page. Please, understand that due to liability issues, I am unable to answer specific medical questions. In 2009 I found out I had (have) Hashimotos. I also learned I had thyroid cancer. My thyroid was removed. Since then I learned how to eat to help control the symptoms that accompany flares. My question is, what do I do now? How do I proceed to a full life. I slid slightly off my diet and suffered the consequences with an array of symptoms. I just want to know how to proceed without damaging more of my body. Kami – Most thyroid conditions result from the immune system attacking the thyroid because the immune system is out of balance. Even when the thyroid is taken out surgically, is ‘dead’, or treated with radioactive iodine the autoimmunity still persists in most cases. Many people will have their thyroids removed, and will develop new autoimmune disorders such as Lupus, Rheumatoid arthritis, etc. The immune system just finds a different target. We need to re-balance the immune system to prevent this (sometimes the autoimmunity can be reversed as well). The gut determines your immune system. With the exception of discussing proper thyroid medication dosing, the majority of my website and my book focuses on balancing the immune system. The info I present is based on my own research in journey for overcoming my autoimmune thyroid condition. I’ve also attached some articles I think will help you find your way. This article is so enlightening. I’ve been struggling with all of these symptoms for years – 10 years to be exact – since my last child was born. I’ve seen four different doctors, all of whom immediately think Thyroid when I describe my symptoms, only for them to order bloodwork and it come back “normal. They then tell me it can’t be my thyroid and I get told to change my diet, take this antidepressant, etc. I’ve tried everything. Finally, my most recent doctor noticed my thyroid has grown significantly and ordered the bloodwork as well as an ultrasound. The bloodwork was “elevated but within normal ranges” as usual, and the ultrasound revealed a goiter. He told me there was no need for medication. My see rate is high, as well. I’ve been tested for Lupus, RA, Diabetes, etc. All clear. In the meantime, my symptoms get worse and more join in. Finally, he told me to get my hormones checked with my gynecologist. She did a “complete hormone panel with a full Thyroid panel” all of which came back normal, except for TSH which was on the high end of normal. She put me on the lowest dose of Armour and it did seem to let me rest a little better and I had a little more energy, but that is all. Next test showed the same, so she took me off of it, said it wasn’t needed. I’ve begged and pleaded with several doctors to refer me to am endocrinologist, but they all say it’s not needed. I’ve tried getting my own appointments but insurance will not cover it without referral and here they will not accept you without insurance. Years ago when this all started and the first doctor gave me these normal results, I sent off for a saliva thyroid panel and those results came back off the charts with me being hypothyroidism. Every doctor told me those tests are not accurate, only the blood tests are. I’m exhausted, I’m in pain, and everyone I know asks me if I have thyroid issues because of my symptoms. You name it, I have it. I even have eye issues now, but the eye doctor says I’ve got 20/20 vision. Please tell me what I can do. How can I get further testing? For years we’ve tried to find answers for my issues and every time we end up at Hashimoto’s. I just can’t find a doctor willing to listen to me enough. Normal for “most people” isn’t normal for everyone. If my tests shoe elevated or low even in normal ranges, does that not mean they could be “not normal for me? You may also be interested in my 12-week online program, called Hashimoto’s Self-Management, that covers all of the strategies that I go through with my one-on-one clients, in a self-paced format, so that participants have access to all of the things I’ve learned about Hashimoto’s without having to schedule costly consults with me or another practitioner. In addition, any person that goes through the program will get access to a Quick search Q&A Database of 1000+ questions asked by past program participants, Root Cause Assessment based on 100’s of my clients’ root causes and triggers, 2-week Meal Plans, recipes, and shopping lists to get you started on the following diets: Paleo, Autoimmune Paleo, SIBO, Candida. Also, Discounts on lab tests, high-quality supplements, and consultations and much more to support you in your journey! There are a few requirements that you should pay attention to, such as my book is a required read. Courtnay – thank you for following this page and the feedback. Did you know that reactive foods trigger an inflammatory response in the GI tract, leading to malabsorption of nutrients (gluten sensitivity, in particular, has been implicated in causing a Selenium deficiency, a well-known risk factor for Hashimoto’s), and can also produce intestinal permeability whenever they are eaten? Most people will see a dramatic reduction in gut symptoms, brain symptoms, skin breakouts, and pain by eliminating the foods they are sensitive to. Some will also see a significant reduction in thyroid antibodies! An additional subset of people will actually be able to get their Hashimoto’s into complete remission just by getting off the foods they react to, normalizing their thyroid antibodies, and some even normalizing their thyroid function! Here are a couple of articles you may find helpful. Diagnosed as having hashimotos. I have had an elevated ANA for over 15 years. My mother had a thyroid issue but I do not know if it was hashimoto (she has passed away). My grandmother had lupus. My son has had some issues ongoing for years and when I read through the hashimoto information it seems like it could correlate. I had his thyroid tests and he has the thyroid peroxidase antibodies but they aren’t out of the normal range. Should a child have this antibody or is anything above a zero indicative of hashimoto? It’s very confusing. Susan – thank you for following this page. Please, understand that due to liability issues, I am unable to answer specific medical questions. Susan -Thank you so much for following this page. I understand your frustration and my heart goes out to you and your son. <3 Here is some information which you may find interesting. Developing autoimmunity is like a three-legged stool, all of these factors must be present for autoimmunity to occur! When you remove one of these, you can prevent or stop autoimmune disease. While we can't change genes, if we know the trigger, we can remove it and we can heal the gut. Thank you for an insightful article. My 17-year-old son was recently diagnosed with Hashimoto’s. He would tell you he had no symptoms, but I felt he was abnormally tired and wanted to sleep too much. The pediatrician took my concern seriously and ordered blood tests. His TSH was 5.9, so they did antibody testing and found 218 TP and 37 TGO. He will soon start a low dose of hormone replacement. I’m concerned that he’s so young and will likely have to deal with this the rest of his life. Are there any studies showing how patients diagnosed with Hashimoto’s as teens do long-term? Is he more at risk for other diseases because of his thyroid condition? Susan -Thank you so much for following this page. Here is some information which you may find interesting. I’m confused. Will my thyroid kick out more hormone (at some point) before burning out? I have had Hashi’s for ten years. My traditional doc just recently reduced my meds by about 10mcgs. I thought maybe my 98% gluten free and about 90% grain free roller coaster (for 4yrs or so…good, then having grain or gluten here and there, not every meal and not even daily) was maybe having benefit. I don’t have physical symptoms (like gut or bowel) to remind me. Then, I had the fear, that my thyroid might be ready to burn out: send out a burst of hormone and slowly die. My roller coaster has been fueled by lack of support (family), the expense of everyone’s supplements (not affordable for me, so I buy what I can over the counter) and, honestly doubt. I can’t afford to see an doc not covered by my insurance (especially when I have no family support). So, even if my thyroid is starting to fizzle, can I restore it by being good on my grain-free, gluten-free, healthy diet? Vicoria – thank you for following this page. Most thyroid conditions result from the immune system attacking the thyroid because the immune system is out of balance. Even when the thyroid is taken out surgically, is ‘dead’, or treated with radioactive iodine the autoimmunity still persists in most cases. Many people will have their thyroids removed, and will develop new autoimmune disorders such as Lupus, Rheumatoid arthritis, etc. The immune system just finds a different target. We need to re-balance the immune system to prevent this (sometimes the autoimmunity can be reversed as well). The gut determines your immune system. With the exception of discussing proper thyroid medication dosing, the majority of my website and my book focuses on balancing the immune system. The info I present is based on my own research and journey for overcoming my autoimmune thyroid condition. Are elevated liver enzymes related to Hashimoto’s? Thanks for educating me in so many ways about Hashi. Vicki – Thank you for following this page. Please, understand that due to liability issues, I am unable to answer specific medical questions, but I highly recommend that you work with a functional medicine clinician. It’s an entire medical specialty dedicated to finding and treating underlying causes and prevention of serious chronic disease rather than disease symptoms. Hi have hashimoto apparently. No one in UK seems to care, I am worried about it. Had scans and asparations done and told yes you have this now go away until it gets worse. I am having trouble swalling and throw up alot and cant stand anyone touching my neck or even a breeze on it makes me gag…I am struggling and dont know what else to say to my doctor. It feels like I have hands round my throat. Do I need medication at this stage? Pamela – thank you for following this page. I understand our frustrations! I highly recommend that you work with a functional medicine clinician. It’s an entire medical specialty dedicated to finding and treating underlying causes and prevention of serious chronic disease rather than disease symptoms. Hi, I tested positive for antibodies and was diagnosed with Hashimotos 22 years ago after my Dr. felt a lump on my thyroid gland. Through ultrasound it was determined that I had an enlarged thyroid…not a goiter. My TSH levels were elevated and I was prescribed Synthroid. About 5 years ago my endocrinologist also prescribed Cytomel after my labs showed I was low in T3 hormone. I also had half of my thyroid removed about 14 years ago. None of my Dr’s have talked about the antibodies or have ever re-tested me for them. I was diagnosed, put on the meds and check my TSH yearly. I usually just follow up with my GP each year for the labs and its like pulling teeth to get them to do more than just the TSH. What tests should my Dr’s be doing…T3, T4, free T3 & T4, reverse, uptake, etc?? ?Does it matter if I take my meds the morning of my blood draw? will that effect my levels? Could I still be having antibody issues and should I be tested for them on a regular basis? Thanks so much for your articles, they are very helpful. When I was diagnosed 22 years there wasn’t much info out there yet. Stephanie – Most thyroid conditions result from the immune system attacking the thyroid because the immune system is out of balance. Even when the thyroid is taken out surgically, is ‘dead’, or treated with radioactive iodine the autoimmunity still persists in most cases. Many people will have their thyroids removed, and will develop new autoimmune disorders such as Lupus, Rheumatoid arthritis, etc. The immune system just finds a different target. We need to re-balance the immune system to prevent this (sometimes the autoimmunity can be reversed as well). The gut determines your immune system. With the exception of discussing proper thyroid medication dosing, the majority of my website and my book focuses on balancing the immune system. The info I present is based on my own research and journey for overcoming my autoimmune thyroid condition. I was wondering if there are other lab tests we should be doing due to the side effects of Hashimotos such as testing for vitamin deficiencies??? Thanks! Stephanie – thank you for following this page. Here are some articles you might find helpful. After suddenly developing Tachycardia at age 37 years, which didn’t go away for 4 weeks, I was diagnosed with Graves disease and put on propylthiouracil. No other symptoms. I hate taking pills and so after four months I slowly weaned myself off, thinking that the worst that could happen is that I develop tachycardia again. But nothing happened. So I’m wondering if you can explain why I have had no sign of thyroid problems 20 years later (now 57 years). Should I be worried/see a doctor? Susan – thank you for following this page. It’s good to hear that you are feeling better. Graves and Hashimoto’s are both autoimmune conditions that affect the thyroid. They are thought to be closely related. Sometimes one turns into the other. The difference is the site of the antibody attack. In Hashimoto’s, the antibodies are found to thyroglobulin (in 80%) and thyroid peroxidase (TPO) enzyme (in 95% of people) – Hashimoto’s results in hypothyroidism and is usually treated with Synthroid and replacement hormone. The same antibodies may be present in a smaller percentage of people who have Graves, but the main antibody is to the TSH Receptor (TSHR-Ab). Usually people with Graves have hyperthyroidism and they are treated conventionally with thyroid suppressing drugs (methimazole) or radioactive iodine to destroy the thyroid. At that point, the thyroid will no longer produce hormones on its own and these people end up on Synthroid as well. Most thyroid conditions result from the immune system attacking the thyroid because the immune system is out of balance. Even when the thyroid is taken out surgically or treated with radioactive iodine, the autoimmunity still persists in most cases. Many people will have their thyroids removed, and will develop new autoimmune disorders such as Lupus, Rheumatoid arthritis, etc. The immune system just finds a different target. We need to rebalance the immune system to prevent this (sometimes the autoimmunity can be reversed as well). The gut determines your immune system. With the exception of discussing proper thyroid medication dosing, the majority of my website and my book focuses on balancing the immune system. The information I present is based on my own research, in my journey for overcoming my autoimmune thyroid condition. Hi there, I have been having “attacks” for years and its always been ruled as anxiety or panic attacks etc. The last attack that i had (which was almost a week ago) was the worst ever where i literally felt as though I’m going to die. I was admitted to hospital and my symptoms were so vague because its difficult to describe how i am feeling when this happens and a doctor decided to run all sorts of tests from an EEG to lab tests in order to find out what the problem was and he did. I was diagnosed with HT and I’m seeing a specialist in the next coming weeks. I’m relieved because finally i know whats wrong but on the other hand I’m scared to get “the attack” again. your article has made me feel so much better especially the remission and reversing part but i have no idea what triggers the attacks and i have no idea where to start with this. are there certain foods that can be avoided or such? Hello. Thank you so much for writing this article. I’m 28 and was diagnosed with Hashimoto’s about 4 months ago and I can’t seem to get it under control. My TSH level started at around 6 when I was first diagnosed. My thylarod glad was also enlarged (i had a rather big bump on my neck) but ultrasound showed no lumps. I got Euthyrox 25, and later went up to 50. After about a month and a half my TSH level was 51. I was completely shocked. Both of my T3 and T4 were always in the normal/ok range. After a little over 2 months of Euthyrox 75, my TSH is down to 8 (T3 and T4 are still ok). Is it normal to have these spikes in TSH levels after receiving medication? I would love to hear your opinion as I’m not getting much info from my doctors. Sonja – thank you so much for following this page. There are quite a few options for thyroid medications. In my experience, what works for one person may not work for another. If your doctor will not prescribe the medication which you are looking for, ask your local pharmacist for doctors in your area who prescribe the medication you are looking to try. Have you read these articles? My son has been diagnosed with Hypothyroidism and Hashimoto. He is six , on the autism spectrum , diagnosed with PANDAS. What treatment options can you recommend for him? You mentioned about working with a functional medicine clinician. What do you mean by that? Gauri – thank you for reaching out. My heart goes out to you and your son. <3 - I highly recommend that you work with a functional medicine clinician. It’s an entire medical specialty dedicated to finding and treating underlying causes and prevention of serious chronic disease rather than disease symptoms. Wiseriver – thank you for reaching out. Please understand I am not able to respond directly to these types of questions here. I highly recommend that you work with a functional medicine clinician. It’s an entire medical specialty dedicated to finding and treating underlying causes and prevention of serious chronic disease rather than disease symptoms. I recently purchased your Hashimotos Protocol book and have started implementing the changes in my daily lifestyle. I have been Gluten and Dairy free for 2 months no with no changes. I am also on NDT ( have been for the last 6 months) however I am losing more hair than ever. I started experiencing hair shedding 4 years ago and I have not been able to find a cure to stop it. I know hair loss was one of your symptoms, what did you implement that made you stop your hair loss and how long did it take? Did all of your hair grow back? I’m only in my early twenties and hair loss is affecting my life as I’m losing hope that my hair will not get back to how it used to be before I was diagnosed. our hair represents our femininity, and losing our hair is a constant reminder that something is off and that we are not well. Sometimes, when your TSH is on the outskirts of the normal range, you can continue to lose hair, and your hair may lack luster and shine. If your hair tangles easily, this is a sign that you may not be getting enough thyroid hormone. Talk to your doctor. You should see a change within 4-6 weeks. Consider the type of thyroid medication you are taking. T3, the more active thyroid hormone, is your “beautiful hair” hormone that helps you grow your hair and prevents it from falling out. Synthroid, Levoxyl, and Tirosint only contain T4, the less active hormone. T4 should be converted to T3 in the body…except this doesn’t always happen. Sometimes an addition of Cytomel**may be cross-contaminated with gluten*** (a T3 medication) or a switch to a medication that contains a combination of T3/T4 such as Armour, Nature-Throid or compounded T4/T3 may result in a return of your hair’s luster and shine. I am 23 and have been recently diagnosed with Hashimoto’s. After my initial appointments and getting my TSH levels back in range, I then waited 6 months for my next appointment and my tests came back with my TSH having risen again. What can cause my levels to change quickly like this? Could it be stress? Are there things I should do or avoid to try to prevent these changes from occurring?..To help manage my antibodies and slow down the progression. I do not have a gluten sensitivity and eat fairly well. So what can be my trigger? Sarah – thank you for reaching out. – Most conventional physicians use the TSH test to determine if one has a thyroid disorder and to dose thyroid medications. However, this test can often times be misleading, as levels of circulating hormones may fluctuate at different times, such as in Hashimoto’s, where the person affected may fluctuate between highs and lows. Additionally, when scientists first set the “normal” ranges of TSH for healthy individuals, they inadvertently included elderly patients and others with compromised thyroid function in the calculations, leading to an overly lax reference range. This resulted in people with underactive thyroid hormones being told that their thyroid tests were “normal,” based on this skewed reference range. Connie – you are so very welcome! Here are some articles you may find helpful. I am 26 and am struggling with thyroid issues. I have been diagnosed with Hashimotos in the last 6 months. My husband and I are wanting to have a baby but we have had one chemical miscarriage this past month. What steps should I take and do you think it is possible to conceive and carry a healthy baby if you have Hashimotos? Thanks for your advice. Sandy – thank you for reaching out. I am so sorry for your loss. Pregnancy can often be a trigger – iron deficiency and immune shift, as well as potentially the baby’s thyroid cells that circulate in the body, may be a trigger. You can bring it back to balance with lifestyle interventions. You might find these articles helpful. Is the LDN life long? Or does that make the correction per se and eventually it will no longer be needed? Stephanie – thank you for following this page. The time to start feeling better will of course vary per person. Once you start to feel better, maintain the dose for 2-3 months and follow-up with your physician to see if your laboratory markers have improved. LDN should be used as part of an arsenal to help you overcome your autoimmune condition. Appropriate levels of Vitamin D, full spectrum light exposure, food sensitivities all play a role in autoimmunity and need to be considered as well. It’s also best to work with a compounding pharmacy that can help you titrate your dose correctly. LDN is not a commonly prescribed medication, and it may not always be possible to convince your doctor to prescribe it. On my quest to try LDN, I talked to my local compounding pharmacist to figure out which doctors in my area were knowledgeable about prescribing LDN. I also want to stress that LDN is not a cure, but rather an immune modulator that can be used to prevent further damage to the thyroid while one is looking for their root cause or to rebalance the immune system when the root cause cannot be found. Root causes are different for different people but may include infections or food sensitivities that result in an immune imbalance. Here are some articles you might find interesting. Thank you for the resource and in-depth information. I was wondering if you could refer me to a reference for what a high antibody result would be / what results would indicate Hashimoto’s? Daisy – thank you for reaching out. Here is an article you might find helpful. I am on levythyroxine and my levels tend to stay in the ok window. I have the lupus anticoagulant antibody and I have Chiari to deal with. Lately every time I wake up my hand arm leg and foot on my right side are completely asleep. To the point I cannot feel where my arm is! No one can tell me what is going on. Could it be my thyroid causing this? I am at wits end. Pam – thank you for reaching out. Please understand, I am not able to respond directly to these types of questions here. I highly recommend that you work with a functional medicine clinician. It’s an entire medical specialty dedicated to finding and treating underlying causes and prevention of serious chronic disease rather than disease symptoms. Great information. Guess I’m 1 in 1000, though. My TSH went low, followed by my thyroid hormones. My mom has thyroid disease, I don’t yet know what type but I have asked her. Her sister also, her great grandmother, her niece honestly most of the females in my family. Anyways I am 37 now and have many of the symptoms fatigue, pale/dry skin, difficulty managing weight (a recent gain of 5 kg despite consistent exercise and a good diet), Depression, mood swings, serious digestive problems (it used to be constipation but now I have violent and explosive stools the consistency of diarrhea which I have had for months with only the occasional reprieve of constipation, I haven’t had a normal stool in years) and menorrhagia for which I have to receive treatment. In college I developed Hypothyroidism but then it was discovered I was pregnant and pregnancy seemed to level me back out. After giving birth (I have only ever been pregnant one time) I was unable to lose weight, I stayed exactly the same weight down to the ounce for a solid year. Nothing I did could shift that weight. Since my thyroid has been up and down and now it is at a plateau of slight elevated. My mom also remained slightly elevated before suddenly entering a critical phase, she nearly died before she received treatment because of the wait and see approach. That same approach is being used with me and I feel fairly certain I will have to reach critical levels before treatment is even possible. I have never been tested for thyroid antibodies but I feel if she does have this type I might be able to site genetics and force my doctor into administering the test. I can’t say they will treat me even if I have it =( Why? I just don’t understand when the medicine for it is safer than the meds for most things. Should I just go gluten free and try and treat myself? I did try gluten free for a year when I was about 33 because of my digestive problems and desperation and actually I lost weight and had normal stools which is why I thought of this type during my research and also the very strong genetic link in my family. Most thyroid conditions result from the immune system attacking the thyroid because the immune system is out of balance. Even when the thyroid is taken out surgically, is ‘dead,’ or treated with radioactive iodine the autoimmunity still persists in most cases. Many people will have their thyroids removed, and will develop new autoimmune disorders such as Lupus, Rheumatoid arthritis, etc. The immune system just finds a different target. We need to re-balance the immune system to prevent this (sometimes the autoimmunity can be reversed as well). The gut determines your immune system. With the exception of discussing proper thyroid medication dosing, the majority of my website and my book focuses on balancing the immune system. The info I present is based on my own research and journey for overcoming my autoimmune thyroid condition. I am from India aged 55 years[male]. I recently discovered this page and find the information to be most comprehensive and detailed. I would like a general opinion on the following situation. i have been recently disgnosed with a condition called”chronic auto-immune urticaria” by an allergist who put me through a series of blood tests which revealed the following. -rh factor–less than 11.50 iu/ml. -anti body to thyroglobulin 15.60 u/ml. I was put through a ASST test[atalogous skin serum test which turned positive for CAU]. i have been prescribed glemont-f which i understand is a anti histamine/anti asthama medicine but no thyroxine. Upon asking, my allergist, says that since my TSH level is around 4.01 i need not have any medicine for thyroid abnormality.I read many articles[including yours] which says that patients with elevated antibodies must be treated for hypo thyroidism. I am not satisfied with my allergist. My symptoms are generalised itching and weals almost everyday. I have had this condition for over three years now. Should i go to a physician who will give me a trial dose of thyroxine to check if my urticaria resolves. Will be grateful for a general opinion on this situation. Here is an article which you may find helpful as well. That’s all great if you have the right insurance or referral- Big Pharma puppet doctors could care less! I do not have the right insurance. I am stage 4 and slowly dying. Now they blame all on mental illness. Can’t wait to die- these doctors are crooks. jjk – thank you for sharing. I understand how frustrating this can be. When I was first diagnosed with Hashimoto’s, I felt so alone. My doctor didn’t think it was a big deal, and none of my friends or co-workers had it. It wasn’t until I started to research online that I found others who were going through the same thing. After reading this article, I now believe that getting 2/3 of the HPV vaccine, Gardasil, may be my big trigger. Do you have any more information on how I can address this root cause? Emily – thank you for following this page. Here are some articles you may find interesting. That is no comfort when you are dying. Now I am having tremors. Not even my family believes me now. Jkk – I am so sorry you are struggling. I understand how difficult and frustrating this can be. When I was first diagnosed with Hashimoto’s, I felt so alone. My doctor didn’t think it was a big deal, and none of my friends or co-workers had it. It wasn’t until I started to research online that I found others who were going through the same thing. Tha k you so much for the article it is very beneficial. I am diagnosed with hashimoto’s and subclinical hypothyrodism with some food intolerances towards gluten, lactose and sorbitol. However, checking my blood pictures for the last couple of years i can see i always have absolute neutropenia and lymphocytosis and sometimes monocytosis. Is this related to hashimotos since the high lymphocytes are the antibodies that attack the thyroid? Thank you Dr. Wentz for this informative article. I have a question regarding the following statement: “Removing the thyroid gland will eliminate thyroid antibodies, but unfortunately, will not stop the autoimmune progression.” I have always wondered if a patient is still considered to have Hashimoto’s after removal of the gland. I have hashi’s and thyroid cancer and have chosen to try to save my thyroid if possible because I assume that I will probably feel worse without it. I didn’t realize that there would still be an autoimmune attack after removal. Can you please expand on this? Kelly – thank you for reaching out. Most thyroid conditions result from the immune system attacking the thyroid because the immune system is out of balance. Even when the thyroid is taken out surgically or treated with radioactive iodine the autoimmunity still persists in most cases. Many people will have their thyroids removed, and will develop new autoimmune disorders such as Lupus, Rheumatoid arthritis, etc. The immune system just finds a different target. Your explanation of the progression of this disease and my experience sound like you are describing my life. I was not diagnosed for almost ten years and I ran the full gamut of anti depression medications, severe acid reflux, mood swings, anxiety, extreme weight gain, general lethargy and brain fog. They did not treat me until my thyroid was too far gone. I noticed you talk about high a high white blood count. I remember them mentioning that in the beginning, so it struck me that I had that too. The original Dr. only did the TSH test and said it was a “little” off, but did not seem like enough to be causing all of my symptoms and put me on an antidepressant. Luckily I found a Rock Star integrative medicine Dr 4 years ago. She did all of the tests you mention and also developed a nutrition and supplement plan (ongoing). Great information! I hope it helps some people before they have to suffer for so many years. So after reading my saga (thank you if you managed to read all 😄) – My question is – if we lower my TSH to the correct level 2,5, will my antibodies also come down? At last check before medication my thyroglobulin was 23 and my thyroid peroxidase Ab was 213 … noone has really explained this properly to me or said how far off my levels are, so I’m a little in the dark as to what these antibody results mean.. How do these antibodies affect implantation / carrying a child… and should I try to get these antibodies as well as my TSH down before having a donor embryo transferred to me? Vikki – Thank you for following this page. Most people feel best with a TSH of around 1 or lower and with a Free T4 and Free T3 in the upper half of the range. It is expected that your TSH will be very suppressed when optimal on NDT medication. How much thyroid replacement therapy is needed is unique and different for each person, so it’s important to work with a functional medicine practitioner or a doctor, who can closely monitor your dosage and your progress.Every six weeks is usually a good schedule for testing your thyroid hormones. Can having had Guillian-Barre syndrome cause or contribute to Hypothyroidism? Julie – thank you for following this page. Epstein-Barr is a virus that causes mononucleosis (commonly called “Mono”), a debilitating viral infection that is common among college students, and is also known as the “kissing disease,” because individuals are exposed to the virus through saliva of those who are infected. Specific immune cells known as CD8+ T cells are needed to fight off the Epstein-Barr virus, however, some individuals may have a low baseline level of these types of immune cells. (CD8+ T cells decrease with age, are lower in women, and in the presence of low vitamin D intake). When these fighter cells are low, the Epstein-Barr virus may take up residence in our organs (such as the thyroid) and essentially hijack the organ to help the virus hide and multiply. The timing of infection may also matter as well, for example, children in developing countries usually contract the Epstein-Barr Virus when they are under the age of 10. This usually results in an asymptomatic infection—one that does not cause them symptoms. In contrast, in developed countries, where individuals are not usually exposed to the virus until they are in high school or college, the infection is symptomatic in 50% of the older kids affected. This is because by the time we reach college age, CD8+ T cells, the ones that fight EBV, have declined by threefold compared with the number of cells we had in childhood. Animal fats, broths, soups and stews support the body’s ability to suppress the viruses. Monolaurin or lauric acid, one of the components of coconut oil, has been found to be active against the Epstein-Barr virus. Replication of many viruses including Epstein Barr is inhibited by glycyrrhizic acid, an active component of licorice root. Quercetin, Co-Enzyme Q10, N-Acetylcysteine, and glutathione were also reported to be helpful in chronic fatigue syndrome because of their anti-viral properties. I was wondering if you might be able to give me some advice please? I am a 32 year old male. I was diagnosed with Hashimoto’s 1 week ago. The TSH reading was 6.03. My T3 and T4 levels are in normal range. I also have anti TPO levels of >1300. I had an ultrasound check which revealed that I had diffused spongiform nodules in my left and right thyroids, which collectively measured 2.5cm x 1.5 cm in space, in each thyroid. I have since started a gluten free diet, and I am taking selenium and probiotics tablets. Apart from this diagnosis, my only symptoms is moderate anxiety. I am also taking 25mg of levothyroxine daily. Is this diagnosis something to be worried about long term, in your medical opinion? Good morning, I came a crossed this website searching for answers, it’s so often that you are let down by doctor’s that you go searching for answers… So here is my story.. I am a 49 year old female who as RA. I take Orencia once a week for this. I have been feeling terrible for over a year now. Can’t sleep, tired all the time, not just tired actual fatigue.. gaining weight, by this I mean I can gain ten pounds in a week.. In fact from the date I had bloodwork taken on the 18th, to the date I went back in for results on the 28th, I gained 10 pounds… Just all around craziness. So, I got test results back and they said Hashimotos. my numbers were TSH 1.52 Free T3 3.37 Free T4 1.09 Reverse T3 15.9 and Thyroid Peroxidase Antibodies 443. They tall me this, yet don’t want to put me on any medication? I don’t understand.. I feel like crap, am gaining more weight day by day, which contributes to the lack of energy, I am so tired I can’t functions some days.. What am I supposed to do?? Why would they not put you on medication for something to prevent losing it entirely?? Can you please help with this ? I just need to know if I should be seeking out other professionals for this or not? Diana – thank you so much for sharing your journey here. I understand how hard this is. It took me three years to get into remission, but every change can bring huge benefits. There are 5 stages to thyroid disease. A conventional doctor won’t look at stopping the autoimmune attack progressing. What we usually see is that a person with only thyroid antibodies and normal TSH is considered to be in Stage 2 of thyroid disease, a person who has an elevated TSH with normal T4/T3 with or without thyroid antibodies, is in Stage 3 of thyroid disease, a person with elevated TSH, lowered T3/T4 +/- thyroid antibodies is in Stage 4 of thyroid disease, regardless if she/he has thyroid antibodies or not. Stage 5, is when the person progresses to other types of autoimmune disease. Functional medicine doctors really aim to find and treat underlying causes and prevent serious chronic disease rather merely treat disease symptoms. I have Hashimotos and hypothyroidism. I am being treated with Armour Thyroid and my doctor recently tested my TPO antibodies and they were at 1926. She did not seen concerned, but I am. Should I go see a specialist and if so, what kind? Thank you. Lacey – thank you for reaching out! I highly recommend that you work with a functional medicine clinician to be a part of your own health care team. It’s an entire medical specialty dedicated to finding and treating underlying root causes and prevent serious chronic disease rather than treating individual disease symptoms. I believe that everyone needs to find a practitioner that will let him/her be a part of the healthcare team. You want someone that can guide you, that will also listen to you and your concerns. You want someone that’s open to thinking outside of the box and who understands that you may not fit in with the standard of care. It’s a good idea to ask some standard questions when contacting a new doctor for the first time. Something else to consider is you can work with a functional doctor remotely, via Skype. You could also contact your local pharmacist or compounding pharmacy, who may be able to point you to a local doctor who has a natural functional approach. But I encourage you to keep looking for the right one for you! Here are some resources you might find helpful. Will the protocol work also if I have a serum negative Hashimoto? Giuliana – thank you for reaching out. Some people with Hashimoto’s test negative for thyroid antibodies because their overall immune health is so weak they do not produce enough antibodies. I’ve tested negative for antibodies several times. Now I’ve insisted on a thyroid ultrasound. Given that Hashimoto’s is one of the leading causes of hypothyroidism worldwide, I wouldn’t stop until I know one way or another. Top 10 Thyroid Tests and how to Interpret them. Thank you for the above, but for me it’s a bit too late. I didn’t find out I had Hashimoto’s until my goiter was pushing out of my neck. Right now it’s cutting off half my windpipe and has even pushed it to one side a bit. I can barely swallow and talking has become forced. I need to have my thyroid removed before I lose the ability to swallow and breathe. Do you have any suggestions for those of us who have reached such an advanced stage before even being diagnosed? Rachel – thank you for sharing your journey. I am so sorry you are going through this. My heart goes out to you. <3 Nodules and goiters are often the result of toxicity and/or the autoimmune process. So, doing interventions to reduce the autoimmune attack on the thyroid, and toxicity, can be helpful to reduce them. I highly recommend that you work with a functional medicine clinician to be a part of your own health care team. It’s an entire medical specialty dedicated to finding and treating underlying root causes and prevent serious chronic disease rather than treating individual disease symptoms. I believe that everyone needs to find a practitioner that will let him/her be a part of the healthcare team. You want someone that can guide you, that will also listen to you and your concerns. You want someone that’s open to thinking outside of the box and who understands that you may not fit in with the standard of care. It's a good idea to ask some standard questions when contacting a new doctor for the first time. Something else to consider is you can work with a functional doctor remotely, via Skype. You could also contact your local pharmacist or compounding pharmacy, who may be able to point you to a local doctor who has a natural functional approach. But I encourage you to keep looking for the right one for you. Here are some resources you might find helpful. I’ve been following your work for a few years, thank you for your resources. During this time except for T3/reverse T3. Would my diet make the antibodies not be present? If I don’t have hashimotos then I can’t seem to find what caused my thyroid issues in the first place. I was so young at diagnosis, but my mom who also has hypothyroidism said no one ever mentioned hashimotos. I can’t seem to find much information about hypothyroidism not related to hashimotos. Lydia – thank you for reaching out and sharing your journey. Some people with Hashimoto’s test negative for thyroid antibodies because their overall immune health is so weak they do not produce enough antibodies. I’ve tested negative for antibodies several times. Now I’ve insisted on a thyroidultrasound. Given that Hashimoto’s is one of the leading causes of hypothyroidism worldwide, I wouldn’t stop until I know one way or another. I am a 28 year old Man from India, now working in Germany. In the month of February this year, there was some pain in my neck near the thyroid gland. I thought, maybe it was due to one of my wrong exercise moves, as I was working out that time. But then, 2 weeks later, the pain was too much. It used to hurt while swallowing something. Also, my left eye lashes were bulged and I felt feverish. So, I immediately went to a doctor. They did the blood test and told me that my thyroid was overactive(TSH: 0.03, T3: 5.9 ng/l, T4: 2.6 ng/dl at this stage). They prescribed Carbimazol 10mg, 2 tablets a day. They told that this is a permanent condition and I’ll have to be on meds for life. I started taking them for a week and the condition wasn’t getting better. I started feeling shaky, feeling like I would collapse when I was walking. So, I called my family doctor in India asking for help. He told me to stop Carbimazol, eat plenty of fruits and just relax, relax for a few weeks and see. This helped me and I felt a little better. Yesterday, I saw one of your videos on youtube and got to know that you had been through this. I’m just waiting right now to get my book delivered soon, so that I can learn more from it. I do not trust the doctors anymore. They also told that they will give an iodine shot after few months if you are still hyper. I just need some help from you on finding the root cause of my problem. When this pain started for me first time in February, I was a very busy person. It was like, I used to get up and do a fast pace workout for 45 minutes; then rush to work and work for 9 hrs; then come back and give some tuitions for my friends; and also parallely learn German. Slept for max 6 to 7 hours. Could this amount of work, have stressed the body and made the body give up? Also, at this time, I was eating animal foods almost everyday, thinking on just protein and protein. I hardly used to eat fruits and vegetables. Could this be the cause? You had mentioned in one of the posts above that there is a possibility that this disease can be reversed. Is there a certain time frame after the onset of this disease, that it cannot be reversed. This last question came up because I only got to know about you yesterday, and feeling that I should’ve found you way earlier this year when my disease had started. Pardon me for asking too many questions. Looking forward to hear from you. Tharun – thank you for reaching out and sharing your journey. Hashimoto’s often is a combination of food sensitivities, nutrient deficiencies, adrenal issues, gut issues as well as an impaired ability to get rid of toxins. Any of those things would prevent a person from getting better. Hashimoto’s is very much an individual condition. While there are root cause commonalities, each person will have their own or in some cases, more than one root cause. You will have to start with the simplest modifications, by removing triggers, followed by repairing the other broken systems to restore equilibrium, allowing the body to rebuild itself. You will need to dig down to why the immune system is imbalanced in the first place and this will tell you how you begin to finally feel better, reduce your thyroid antibodies and even take your condition into remission. Good day. I have been battling symptoms for years. I was actually told that at 45 I was just old and that being tired was just part of the process. I was put on an ever increasing dosage of antidepressants. Finally someone listened to me and I was diagnosed with Hashimoto’s – my antibody level was 434.4. I have been on Levothyroxine for several years and though I no longer fall asleep for 3 hours after I take my dog for a walk in the morning, I still suffer fatigue, weight gain, gastrointestinal trouble etc. Recently my TSH level was shockingly low (.167) which has never been the case. My prescription hasn’t changed and my last TSH test was 1.29 just 3 months ago. My Free T4 was 1.5 – which is pretty much where it usually is. I am so confused as to what is going on. I was just scoped to determine if I have Celiac disease. I was told I am lactose intolerant. I am struggling to make sense of everything. I have constant fatigue, bloating, gas – mostly burping, my periods – even though I was put on birth control to counteract hot flashes – have become completely abnormal – some months I don’t even have one, I have significant break outs like I haven’t had since I was a teenager – I am now 48. I feel like I am on a constant rollercoaster. I tried talking to my endocrinologist and she suggested I needed spiritual healing! I asked if I should change my diet – go gluten free (I have been vegetarian for 25 years) or cut out sugar. She said there was no need. Everything I read about Hashimoto’s suggested gluten could be troublesome so I tried going gluten free and think I did feel a bit better. I went back on gluten so that I could be officially tested and have felt horrible. I feel increasingly crazy! It seems as though doctors want to dismiss my complaints. The more they dismiss the crazier I feel! I just want to get back to the world of the living. After this long prelude my questions are 1. What does the low TSH in my last bloodwork indicate? and 2. Should I continue to push for answers or should I just resign myself to reading internet posts and messing with my diet to find what works? Jennifer – thank you so much for reaching out and sharing your journey. I am so sorry you have had to go through this. <3 Most people feel best with a TSH of around 1 or lower and with a Free T4 and Free T3 in the upper half of the range. It is expected that your TSH will be very suppressed when optimal on NDT medication. How much thyroid replacement therapy is needed is unique and different for each person, so it's important to work with a functional medicine practitioner or a doctor, who can closely monitor your dosage and your progress. Every six weeks is usually a good schedule for testing your thyroid hormones. Please do not give up! I believe that everyone needs to find a practitioner that will let him/her be a part of the healthcare team. You want someone that can guide you, that will also listen to you and your concerns. You want someone that’s open to thinking outside of the box and who understands that you may not fit in with the standard of care. It's a good idea to ask some standard questions when contacting a new doctor for the first time. Something else to consider is you can work with a functional doctor remotely, via Skype. You could also contact your local pharmacist or compounding pharmacy, who may be able to point you to a local doctor who has a natural functional approach. But I encourage you to keep looking for the right one for you! Here are some resources you might find helpful. My anti-TPO have always been between 400 and 800 for the last ten years. In 2015, they were at almost 5,000 and my endocrinologist wasn’t worried about it. Now, I went through a major depression at the same time. They went down around 1,000 after that. I had my levels checked last week again and now they are at 3,900. Should I consider a thyroid removal? I feel like crap even though I take .88 of Levo and my TSH is within normal range. Thank you for your advise. Maite – thank you for reaching out. I am so sorry to hear you are struggling with this. My heart goes out to you. <3 Most people feel best with a TSH of around 1 or lower and with a Free T4 and Free T3 in the upper half of the range. It is expected that your TSH will be very suppressed when optimal on NDT medication. How much thyroid replacement therapy is needed is unique and different for each person, so it's important to work with a functional medicine practitioner or a doctor, who can closely monitor your dosage and your progress. Every six weeks is usually a good schedule for testing your thyroid hormones. I believe that everyone needs to find a practitioner that will let him/her be a part of the healthcare team. You want someone that can guide you, that will also listen to you and your concerns. You want someone that’s open to thinking outside of the box and who understands that you may not fit in with the standard of care. It's a good idea to ask some standard questions when contacting a new doctor for the first time. Something else to consider is you can work with a functional doctor remotely, via Skype. You could also contact your local pharmacist or compounding pharmacy, who may be able to point you to a local doctor who has a natural functional approach. But I encourage you to keep looking for the right one for you! Here are some resources you might find helpful. Can a person be really agressive due to the disease? Hi Dr. Wentz, I was diagnosed with hypothyroidism this summer (TSH 4.3). My doctor ran both Hashimoto’s antibody tests which came back negative. I also believe my doctor told me that my ultrasound did not show signs of Hashimoto’s. I have had symptoms for YEARS like you mention but “normal” tests. After reading many books on hypothyroidism, I had myself tested for Epstein Barr Virus. My VCA IgG and Nuclear Angiten IgG were off the charts in the triple digits with a negative early antigen IgG. My question is, is it possible to have non-Hashimoto’s hypothyroid with Epstein Barr virus? Or is it likely that I actually have Hashimoto’s but it hasn’t been detected? I am mostly concerned due to dietary reasons. I know if I have Hashimoto’s, I need to look at my diet and make some big changes. My doctors have known I had hypothyroid issues for many years, but I was unable to tolerate synthroid or levothyroxine so I went untreated for a number of years until Tirosint became an option with the medical community finally understanding sometimes it is the fillers in medications people can’t tolerate. I did wonderfully on Tirosint. My numbers headed towards normal, I dropped a lot of weight in quick order and then maintained a level weight for about 3 years. Unfortunately, my dosage kept having to be raised every time I had blood work, but it still was working. Until recently. About 5 months ago, it was like my thyroid just shut down completely. I’ve gained about 60 pounds despite more exercise and no changes to my diet. My most recent blood work showed my free t4 slightly low (0.77), but my TSH is frighteningly high at 55.48!! I’m beside myself and don’t know what to do next. Jennifer – thank you for reaching out. I am so sorry you are struggling with this. Here are a couple of things to think about. I am diagnosed with hypothyroidism and my mother has Hashimoto (as well as other family members). So, the chances are big that I probably have it to. Before it this was diagnosed though, I was diagnosed with B12 deficiency. I took shots once a week for almost a year, but we saw very little progress. Therefore, my mom thought I might have hypothyroidism, but the blood results showed just a slight difference from the norm. Therefore, it was said it was the stress. I was (/am still) experiencing stress, fatigue, difficulties with my gut/intestines, concentration issues, weight gain, feeling low etc… Therefore, we were wondering if there was a connection between B12 deficiency and hypothyroidism/Hashimoto. That when you get B12 shots, but not the levothyroxine, the effect of the B12 shots don’t work and that therefore the symptoms don’t go away. I am currently writing an essay about the connection between the two (since it is said that patients with Hashimoto have a higher prevalence of B12 deficiency). Do you maybe have any more information about this matter? And do you, maybe have scientific articles that prove the claims made in this article that I can use for my essay? Kady – thank you for reaching out and sharing your journey. The most common triggers in Hashimoto’s are; nutrient deficiencies, food sensitivities, intestinal permeability (leaky gut), stress, an impaired ability to get rid of toxins and in some cases, infections. Optimizing your health starts with food. Figuring out which foods nourish you, and which ones cause you harm is the single most important thing you can learn in your health journey. I wanted to pass along these articles that I wrote. I hope they help. I am currently on my health journey of being diagnosed with Hashimoto’s officially 3 years ago. I had extensive blood work, which I will do again end of January. I have had my WBC count drop from 3.2 to 2.9 all within about a year and also tested for the MTHFR gene, which I have a mutation with. In your experience, are these related to the Hashimoto’s or a totally separate issue? Thanks for your input. Thank you so much for this article, I have the genetic deposition on my mothers side both her and her sister had it. However, I am having a hard time being diagnosed and unfortunately am one of those people they as being a hypochondriac more than someone who has a predisposition. I found out I had Thyroid nodules in 2017, but my TSH was 2.7 and my Free T4 was .7 so they didn’t care about the symptoms. At that point my anti TPOs were elevated. I had hair loss, wieght gain that was fluctuating, dry skin, edema in my legs, and I’m only 36. The endocrinologist just passed me back to my primary care. I was retested last month (at my request) and my TSH was 5.01 and Free T4 was .8. They didn’t like the results so I was retested this Monday and the results came back as TSH 2.8 and Free T4 1.2. I am at a loss for words and don’t even know if I can walk into the office without them saying “we told you so, it hasn’t changed, those numbers are a fluke.” Did I mention I’m a Veteran. Hope – thank you for your service and for sharing your journey with me. I am so sorry you are dealing with all of this. You are not a lost cause! <3 Most conventional physicians use the TSH test to determine if one has a thyroid disorder and to dose thyroid medications. However, this test can often times be misleading, as levels of circulating hormones may fluctuate at different times, such as in Hashimoto’s, where the person affected may fluctuate between highs and lows. I would like to thank you for all the work you’ve done here. I have hashimoto’s for about 10 years, few years before that i was diagnosed with autoimmune hepatitis and through a change of lifestyle and adding some helpful supplements got free of it. Later i shifted my lifestyle back to being unhealthy as i thought it was alright. About a year ago my body let me know how wrong i was. My antibodies however went down on itself by half since three years ago. I know i am feeling much worse now and am trying to make my lifestyle more healthy again. But i would like to ask if it’s normal, that the antibodies come down on itself if i did nothing to help it. Barbora – thank you for reaching out. IgG subclass antibodies have a half-life of 21 days and stick around on immune cells for about two to three months. They need constant “reminders” in the form of an antigen so that their production continues. If the antigen is removed, the antibodies will go away as well. The time period required for them to completely forget about the antigen and disappear is nine to twelve months. 1) The thyroid stops expressing TPO. 2) The thyroid cells are not damaged and able to regenerate. 3) There are no substances that look like TPO (glandulars, gluten, infections, other triggers). 4) The immune system is balanced. 5) The autoimmune cells are confused by a decoy. In the case of autoimmune conditions, traditional and alternative medicine practitioners may focus on rebalancing the immune system (i.e. steroids and immune-modulating drugs used in traditional medicine, or else herbs, supplements, or acupuncture used in alternative medicine). While this approach may be helpful for taming the immune system in the short term or overcoming autoimmune flares, it is often a temporary solution and the immune system may become imbalanced again once the medications,acupuncture, and herbs and supplements are stopped if the underlying issue that lead to the immune system imbalance is not addressed. Thus we can say that immune modulation treats only the symptoms, and not the root cause. Identifying and eliminating triggers and toxins will likely take a few weeks to a few months. Providing the thyroid with the nutrition needed to help rebuild and detoxify will likely take three to six months. Rebalancing the immune system by addressing the root cause of autoimmunity (intestinal permeability, gut dysbiosis, infections) may take one to three years, but in the meantime, we can modulate the immune system and throw our thyroid antibodies a decoy. Hope this helps! I was recently diagnosed with underactive thyroid and Hashimoto’s. My levels are way out of whack: TSH 14.45 (.45-5.33) – TPO/AB 9864.20 (0-9) – Free T4 .54 (.58-1.64) However, I’m not super symptomatic. In fact, didn’t know I had an issue with my thyroid. I had gone to the doctor regarding pain under my left rib that I’ve had for years. I had gone gluten-free 6 years ago and recently fell off the diet. I started feeling awful, so went in for the left-side-pain. They did an allergy test and said I was not allergic to gluten, so I started eating it again. Bad idea. I felt like I was dying. So, I went back to the doctor and they ran bloodwork. The above levels are what we found. My doctor says they don’t treat Hashi’s and just wants me to start Synthroid. I’m reluctant to start a lifelong relationship with pharmaceuticals, without treating the actual issue. So I went home and started your protocol immediately. In days my symptoms left. I have an appoint in 1 month with an endo. I would like them to retest my levels then to see what diet alone does. If I can seem to bring my levels down, do I have to go on pharmaceuticals? I rarely ever even take ibuprofen and am terrible at taking pills on time, let along every day. I’m 54 years old, 5’4″ and weigh 139 lbs. Beth – thank you so much for sharing your journey with me! I am so happy to hear you are feeling better. <3 I cannot say whether you will ever need medication as everyone is different. I highly recommend that you work with a functional medicine clinician to be a part of your own health care team. It’s an entire medical specialty dedicated to finding and treating underlying root causes and prevent serious chronic disease rather than treating individual disease symptoms. I believe that everyone needs to find a practitioner that will let him/her be a part of the healthcare team. You want someone that can guide you, that will also listen to you and your concerns. You want someone that’s open to thinking outside of the box and who understands that you may not fit in with the standard of care. It's a good idea to ask some standard questions when contacting a new doctor for the first time. Something else to consider is you can work with a functional doctor remotely, via Skype. You could also contact your local pharmacist or compounding pharmacy, who may be able to point you to a local doctor who has a natural functional approach. But I encourage you to keep looking for the right one for you! Here are some resources you might find helpful.